There’s no place like home for the holidays, and with this elegant 6 ft. x 9 ft. area rug from Rug Agent, your home’s decor will never be the same. There’s no place like home for the holidays, and with this elegant 6 ft. x 9 ft. area rug from Rug Agent, your home’s decor will never be the same. The center of this rug features an ivory background that is filled with square shaped bouquets of colorful flowers and leaves. The “flower garden of color” is surrounded by a rose colored border that is also filled with a floral design. The soft tones this area rug offers will make it an elegant addition to just about any room. Step out of bed and step onto comfort when you place this traditional style area rug in your bedroom. Place it in an entry way to impress guests as they arrive. 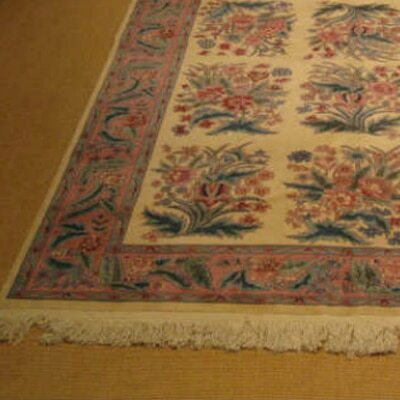 Brighten the decor of your living room or dining room with the delicate colors and floral design of this hand made area rug. The possibilities are endless! Although the list price for this item is $2,300.00, you can purchase yours today for just $1,350.00. That’s nearly $1000 in savings!